I had already finished the blog last night when I started to find the humor in our bathroom incident that happened at bedtime. Graham was happily taking a shower, Anderson was sitting on the toilet and I was right by the bathroom doing something. Anderson shouted "turn it off! turn it off! it is overflowing!" I burst in to find water pouring out of the bathtub and was 2 inches deep beside the tub. Anderson continued screaming and finally Graham who was still happily taking a shower realized something was happening. By this time, Robby came in thinking the potty was overflowing just as Graham turned off the shower still not knowing what was happening. The shower curtain wasn't pulled back all of the way and the shower head was aimed toward the curtain so all of Graham's shower water was just pouring on the floor. Quite the excitement for us! And back to this morning, after breakfast we loaded up and then Robby passed out the kids headphones-the first time to use them on the trip. The headphones worked well for a quite a while-except they were watching a Little House on the Prairie and we like to listen to those. So we still had the sound on so we could hear. The very first stop of the day was a jump out so we could snap a few pictures of Woodrow Wilson's home. Robby says that we have only taken pictures of that house before but I do believe that we have been on a tour inside. The home of Thomas Jefferson was the next stop of the day. After Robby bought the tickets at Monticello, we rode the bus to the house. We walked along the slave quarters area and then started our tour. We had tried to book a family friendly tour but with 12 kids on our tour, we must have had a family friendly tour. The guide was excellent and spent more time talking to the kids than the grown ups. My favorite parts were his clock that showed not only the time but also the days of the week-when the clock shows Saturday, it had to be in the basement! After the tour, we walked under the house to see the "dependencies"-the area down stairs that the family was "dependent" on. That was probably the kids favorite part since they had a dumb waiter to play with along with some lock and keys. Then back at the ticket area, they had a huge children's area. My kiddos could have stayed there for the longest time-blocks, pretend food, a bed like Thomas Jefferson and many other areas. 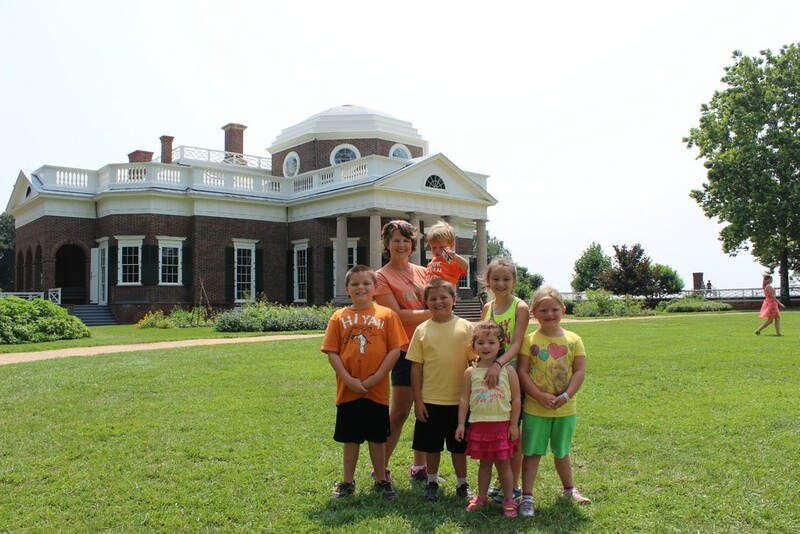 Monticello definitely has made their tour and grounds very family friendly. Robby and I can vividly remember walking up to Monticello from the parking lot many years ago-when I was pregnant with Reagan. Today, we did wise up and rode the bus there but we did opt to walk back down the hill on the trail. The trail was shady and pleasant and best of all-there were no bears! To continue our presidential home tour, we drove a few miles down the road to Ash Lawn Highland, the home of James Monroe. (Presidential Homes seen on this trip: Jefferson, Wilson, Monroe, Lincoln, Jackson, Obama) We didn't go through Monroe's home but we did stop to eat lunch on his picnic tables under his apple trees. It was a nice little stop and the kids did need to run around a bit before our 2 hour drive to Booker T's house. We had to hurry, hurry to make it there in time. We barely made it to the Booker T. Washington's National Monument before they closed. We pulled in at 4:42 and rushed inside. I quickly stamped our books and then we walked around the exhibits. Then we went into the field out back to see the animals. Reagan had said that she didn't think she had ever seen a pig which I am not sure is very accurate. I might just get her a pig for Christmas now. But I guess I had never seen a pig as large as the ones that were there. Then we walked to the stable and saw the turkeys and chickens Finally, we had just a few minutes to walk and see the outline of the cabin that Booker T. was born in. Then it was a dash to the bathrooms so we could stop there before they locked the doors and shut the gate. Then it was back in the car and on our way to North Carolina (a new state for Keaton and Whitman). After leaving Booker's place, we headed towards Mt. Airy, NC. I guess that there isn't really a direct route between those two places. At one point the GPS said 35 miles left to drive which would take an hour. Eeek! We twisted and we turned and we drove through tobacco fields. There was no cell phone signal and I am glad that we made it! I probably shouldn't have been that worried-I even saw a gas station that had gas for 7.53! We drove right into Mt. Airy and the town was pretty much closed up even though it was just about 7. We did find a local dive (Speedy Chef) to eat at-burgers, hot dogs, bbq, blt, french fries, steak burger and hush puppies. Then we followed our supper with desserts-apple pie, ice cream, strawberry shortcake, hot fudge cake and chocolate dipped ice cream. I was getting napkins when Robby was ordering dessert and I even got tickled at his items that he was ordering-it just went on and on and on. I guess that some of the locals could tell that we weren't from there so they started talking to us. One nice old couple told us that we needed to drive down and see the granite quarry so when we left, we drove down to see it. The quarry was really old and the world's largest open face granite quarry. There wasn't a whole lot to see there but it did kill a bit of time before getting into our hotel. The was probably one of our earliest evenings but we squandered our time by watching a a clip of Rocky and then an episode of The Andy Griffith show. The kids have seen Andy once so they needed a refresher before we walk down Main St. tomorrow.